We describe a new toxodontid species, Nesodon taweretus sp. nov., from the Aisol Formation in Mendoza Province, central-west Argentina. Nesodon is a frequently found Toxodontidae, member of the Notoungulata, an extinct endemic group of Cenozoic South American mammals that are ecologically similar to current hoofed ungulates. The holotype of N. taweretus sp. nov. is a skull, and we tentatively assign some mandibular fragments and postcranial bones. N. taweretus sp. nov. differs from the other Nesodon species in several cranial and dental features, and close comparisons were made with the Patagonian Nesodon imbricatus, common in the Santa Cruz Formation (Santacrucian Age, Early Miocene). The material is of a similar size to N. imbricatus, with a body mass estimation of about 550 kg. The phylogenetic analysis groups N. taweretus sp. nov. with other species of Nesodon. The absolute age of the Aisol Formation has been established at ca 19.480 ± 0.025 Ma (Burdigalian; Early Miocene) by means of U–Pb zircon dating. The vertebrate association is encompassed by the Santacrucian Age. Latitudinal separation between Mendoza and Patagonia in the south would have favored taxonomic differences, as reflected in the species of Nesodon. The online version of this article (doi: 10.1007/s12542-014-0233-5) contains supplementary material, which is available to authorized users. Wir beschreiben eine neue Art der Toxodontiden, Nesodon taweretus sp. nov., aus der Aisol-Formation in der Provinz Mendoza, im Zentralwesten von Argentinien. Nesodon ist ein häufig vorkommendes Taxon der Toxodontidae, die zu den Notoungulaten, einer ausgestorbenen Gruppe von endemischen Säugetieren des Känozoikums in Südamerika, gehören und den rezenten gehuften Ungulata ökologisch ähnlich waren. Der Holotyp von N. taweretus sp. nov. ist ein Schädel, dem wir vorläufig einige Unterkieferfragmente und postkraniale Knochen zuweisen. N. taweretus sp. nov. unterscheidet sich von den anderen Nesodon-Arten in mehreren Merkmalen des Schädels und der Bezahnung. Enge Vergleiche wurden mit dem aus Patagonien stammenden und in der Santa-Cruz-Formation (Santacruzium, frühes Miozän) verbreiteten Nesodon imbricatus gemacht. Das Material ist von ähnlicher Grösse wie N. imbricatus, Schätzungen der Körpermasse ist etwa 550 kg. 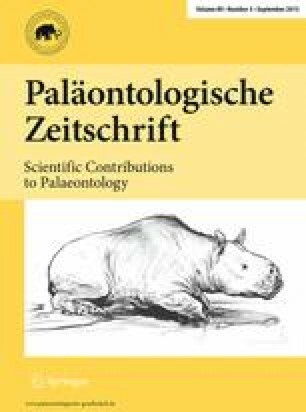 Die phylogenetische Analyse gruppiert N. taweretus sp. nov. mit anderen Arten von Nesodon. Das absolute Alter der Aisol-Formation wurde mittels der U–Pb Zirkondatierung auf etwa 19.480 ± 0.025 Ma (Burdigalium, Unteres Miozäns) gesetzt. Die Wirbeltiervergesellschaftung in das Santacruzium eingeschlossen worden. Latitudinale Trennung zwischen Mendoza und Patagonien im Süden hätte taxonomischen Unterschiede begünstigt, wie das anhand der Arten von Nesodon widergegeben ist. We acknowledge two anonymous reviewers for their observations that improved the original manuscript; G. H. Cassini for his valuable assistance in the paleobiological aspects; S. D. Kay for reviewing the English; M. S. de la Fuente and M. R. Sánchez-Villagra for support and suggestions during manuscript preparation; R. D. E. MacPhee for helpful comments on notoungulate anatomy; and J. Blanco for the artistic reconstruction of N. taweretus sp. nov in Fig. 1. The Willi Hennig Society provides a free version of the TNT program. This research was financially supported by the project CONICET-PIP 2011–2013 0276. Davydov, V.I., J.L. Crowley, M.D. Schmitz, and V.I. Poletaev. 2010. High-precision U–Pb zircon age calibration of the global Carboniferous time scale and Milankovitch-band cyclicity in the Donets Basin, eastern Ukraine. Geochemistry, Geophysics, Geosystems 11: Q0AA04. doi: 10.1029/2009GC002736. Schmitz, M.D., and B. Schoene. 2007. Derivation of isotope ratios, errors and error correlations for U–Pb geochronology using 205Pb–235U–(233U)-spiked isotope dilution thermal ionization mass spectrometric data. Geochemistry, Geophysics, Geosystems 8(8). doi: 10.1029/2006GC00149. Straehl, F.R., T.M. Scheyer, A.M. Forasiepi, R.D. MacPhee, and M.R. Sánchez-Villagra. 2013. Evolutionary patterns of bone histology and bone compactness in xenarthran mammal long bones. PLOS ONE 8(7): e69275. doi: 10.1371/journal.pone.0069275.